Historic walls typically have a saddleback coping, which is a triangular shaped brick to shed water from the top of the wall. 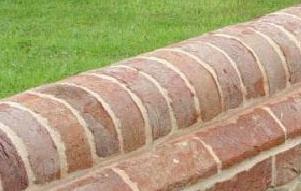 Sometimes half round bullnose brick is used, particularly in farmyards. Bovingdon make handmade red stock and multistock bricks, specials including bullnose and saddleback coping and round, segmental and gauged brick arches. Charnwood, as part of the Michelmersh Group, manufacture a range of handmade bricks. They have produce glazed grey bricks to match the salt glazed Luton Grey and Reading Grey bricks. Lambs are suppliers of gauged brick arches, rubbed brick, handmade brick, glazed headers, paviors, terracotta, faience and Wealden Sussex stone as well as stocking Portland, Bath, York and other indigenous British stone.